Oracle Enterprise Manager Ops Center uses libraries to store and manage cached data, images, packages, and metadata. A library that stores images for provisioning operations is a Software Library. At least one software library always exists on the Enterprise Controller. Another type of library is a storage library. See Chapter 6, "Storage Libraries" for information about this type of library. Figure 5-0 lists the tasks and the role required to complete the task. Contact your administrator if you do not have the necessary role or privilege to complete a task. See the Oracle Enterprise Manager Ops Center Administration Guide for information about the different roles and the permissions they grant. Figure 5-0 shows where to find information. Expand Libraries in the Navigation pane, then expand Software Libraries. Expand Plan Management in the Navigation pane, then click Profiles and Policies. By default, Oracle Enterprise Manager Ops Center operates in Connected mode. In this mode, the Enterprise Controller uses the Internet to download images and metadata from the Oracle Knowledge Base and the Oracle Solaris 11 Package Repository. The Oracle Knowledge Base (KB) contains metadata for Oracle Solaris 10, 9, and 8 and Oracle Linux OS components. The Oracle Solaris 11 Package Repository includes packages of images in IPS format for Oracle Solaris 11. To use the Oracle Enterprise Manager Ops Center software without Internet access, your site can maintain a local version of the Knowledge Base or Repository on your site's network. In this case, the Enterprise Controller connects to the local network location to get the latest information. The Enterprise Controller must have at least one Software Library to store the new versions of images that are downloaded from the Oracle Knowledge Base. Oracle Enterprise Manager Ops Center updates this library each week, by default. In addition to the routine download operations, you can create jobs to update assets. When you submit an update job for specific target assets, the Agent Controllers on the targets send a request to the KB through the Enterprise Controller to download the latest information. The product installation procedure creates the Initial EC Library. At any time, you can specify a different software library to accept the automatic download operations from the Knowledge Base. A badge identifies the current active library. Figure 5-1 shows the badge, a white down arrow on a green background. Description of "Figure 5-1 Badge Identifying the Current Default Library"
Create a software library, as described in Creating a Software Library. Expand Administration in the Navigation pane. Click Set Enterprise Controller Storage Library in the Action pane. The window lists all libraries with the current library highlighted. Click the new software library. When the job is completed, the Library section of the Navigation pane shows the software library you selected as the default library. The Oracle Solaris 11 Package Repository resides at the Oracle site: http://pkg.oracle.com/solaris/release/. This repository has the role of Publisher and Parent for your local repository. The Oracle Solaris 11 Package repository is similar to the Knowledge Base but is only for Oracle Solaris 11 images and updates. Instructions to specify the services to restart on the system, to specify the aliases to update for a hardware driver, or to create the users and groups. Other parent repositories, such as Oracle Solaris Cluster, are available. You can configure more than one parent repository and provide their credentials. For a list of available Oracle repositories and to download the key-certificate pair, see the pkg-register.oracle.com site. In addition to the EC Library, you can create more Software Libraries and organize their content, according to your site's purposes. You can use a file system on the Enterprise Controller's system or a shared file system on an NFS server that the Enterprise Controller mounts. The file system on the Enterprise Controller is called a local software library. The file system on the NFS server is called a NAS software library. See Types of Storage for Libraries. When Oracle Enterprise Manager Ops Center provisions target systems with an operating system or firmware, it copies the images files from the designated Software Library to the Proxy Controller that manages the target. The Proxy Controllers handle the provisioning operations. When Oracle Enterprise Manager Ops Center provisions target systems with an update to an operating system, it uses the software library named Linux and Oracle Solaris 8-10 Software Update Library or the Oracle Solaris 11 Software Update Library. You can display the contents of the software library, its associations, and details about the disks in the software library. You can also see how Oracle Enterprise Manager Ops Center monitors the library and any problems. Expand Libraries in the Navigation pane. The details of the selected library are displayed in the center pane in a set of tabs. To see the results of monitoring the software library, click the Incidents tab. To see the attributes and values that are being monitored, click the Monitoring tab. You can create a software library that uses space on a file system on the Enterprise Controller's system, which is a Local Software Library. You can also create a software library that uses space on a shared file system on an NFS server. This type of library is a NAS Software Library. When you use both local and NAS software libraries, do not use the same name for the library. Click New Local Software Library in the Action pane. Enter a unique name and description. In the URL field, enter the location of the file system. Click New NAS Software Library in the Action pane. Enter a unique name and a description. To use a unified storage appliance, select an appliance and specify the exported share to use. To use an NFS server, enter the host name and path for the NAS appliance. The Oracle Solaris 11 Image Packaging System (IPS) contains the packages that you need to install, provision, and update your Oracle Solaris 11 operating system. Each IPS package has an associated manifest that describes how the package is assembled. The package manifest provides basic metadata about the package (such as name, description, version, and category), what files and directories are included, and the package dependencies. Packages might specify the services to restart to refresh some configuration on the system, specify the aliases to update for a given hardware driver, or the users and groups to create as part of the package installation process. A package repository holds all software packages and systems must connect to the repository to install software updates. 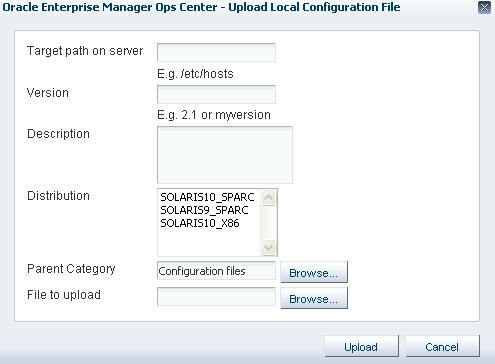 The Enterprise Controller can manage a local copy of a parent repository for the Oracle Solaris 11 Image Packaging System (IPS). The local repository, called the Oracle Solaris 11 Software Update Library, is used to provision the Oracle Solaris 11 operating system on assets. You configure the Oracle Solaris 11 Software Update Library when you install Oracle Enterprise Manager Ops Center, or you configure the library after installation. You assign storage to the Oracle Solaris 11 Software Update Library, and then populate it with a local copy of the IPS. The host system for the Enterprise Controller must use the Oracle Solaris 11 operating system. Do not attempt to initialize an Oracle Solaris 11 Software Update Library on a different Oracle Solaris operating system. Unconfigured – Oracle Solaris 11 Software Update Library was not configured when you installed and configured Oracle Enterprise Manager Ops Center. Configuring – The Oracle Solaris 11 Software Update Library is in the process of being configured. Syncing – The Oracle Solaris 11 Software Update Library is in the process of updating and synchronizing with the IPS or is in the process of being reconfigured. The Oracle Solaris 11 Software Update Library is locked and unavailable for use when in this state. OK – The Oracle Solaris 11 Software Update Library is ready to use. If the Oracle Solaris 11 Software Update Library is in an unconfigured state, use the Initialize Oracle Solaris 11 Software Update Library action to populate the library with a local copy of the IPS packages. When complete, the new library appears in the Libraries section and contains three sections: Summary, Boot Image, and Packages. The process of initializing the library takes several hours. To keep the Oracle Solaris 11 Software Update Library up to date, synchronize it with the parent IPS repository. The Oracle Solaris 11 Software Update Library is locked during the process and you cannot perform OS provisioning or OS update tasks. When the Oracle Solaris 11 Software Update Library is configured, its Summary tab, shown in Figure 5-2, provides an overview of the health, status, and last update. The URL listed on the Summary is the location of the Oracle Solaris 11 Software Update Library. The size is the amount of space allocated to the file system, and the used space shows the amount of space used by the packages that are located in the library. The Publishers table shows each Parent Repository and its credentials. The URL is the location of the Parent Repository for Oracle Solaris 11 packages and content located in the Image Packaging System (IPS). These URLs are used to synchronize the information in your Oracle Solaris 11 Software Update Library with the Image Packaging System. The Parents list is created when you use the Configure Parent Repositories Wizard. If your site has its own local repository for Oracle Solaris 11 packages, update Oracle Enterprise Manager Ops Center's library from that location. Description of "Figure 5-2 Oracle Solaris 11 Software Update Library Summary"
The Content tab, shown in Figure 5-3, displays a list of the packages in the Oracle Solaris 11 Software Update Library with a brief description of each package. You can filter the list of packages by selecting a category or version. You can also search for a specific package. Description of "Figure 5-3 Oracle Solaris 11 Software Update Library Content"
You manage publishers for the parent repository and synchronize the Oracle Solaris 11 Software Update Library with the parent. You can create a recurring schedule to synchronize the Oracle Solaris 11 Software Update Library during non-peak hours. In the Configure Parent Repositories Wizard, create a list of parent repositories and associated credentials that you use to update the Oracle Solaris 11 Software Update Library. During the synchronization operation, all the content in the parent repository is compared to the existing content in the Oracle Solaris 11 Update Software Library and new or updated content is downloaded. Oracle Enterprise Manager Ops Center synchronizes with a parent repository to maintain the Oracle Solaris 11 Software Update Library, that is, the Oracle Solaris 11 Software Update Library is a child of the parent repository. If your site already has an Oracle Solaris 11 IPS repository for other purposes, you have the option of declaring that repository as the Oracle Solaris 11 Software Update Library. Operations that use IPS content retrieve the content from your IPS repository. Because it is not a parent-child relationship, no synchronization is performed. When you install Oracle Enterprise Manager Ops Center or when you initialize the Oracle Solaris 11 Update Software Library, identify your IPS repository as the Oracle Solaris 11 Update Software Library. All operations that use this software library will retrieve content from the IPS repository. Oracle Enterprise Manager Ops Center does not maintain the content of the IPS repository. You must maintain this repository manually. Locate your site's Oracle Solaris 11 IPS repository or create one. Click Initialize Solaris 11 Software Update Library in the Action pane. In the Specify Library Location field, enter the location of your IPS repository. In the URL field for the parent repository, do not enter any text. Leave this field blank. Use the Add Content action to specify a parent repository and add ISO image files to the Oracle Solaris 11 Software Update Library manually. The parent repository URL and credentials are not saved when you use this action. To save a list of repositories, use the Configure Parent Repository action. You can delete the library and keep its packages and content, or you can delete the library and all of its contents. Update Profiles and any profiles you create that provision an OS or firmware image rely on the contents of a software library. For Oracle Solaris 10, 9, and 8 and for Oracle Linux, a dedicated software library called Linux, Solaris 8-10 Software Update Library contains the packages, updates, and site-specific scripts and configuration files for these operating systems. You configure the Linux, Solaris 8-10 Software Update Library when you install Oracle Enterprise Manager Ops Center, or you can configure the library after installation using the Create Update Library action. You can change the display of the contents of the library according to the OS distribution, the category, the type of view, and the version. See Images for information about managing the content in the library. See Local Content for information about managing the content of the local categories. In most cases, all the images you need are downloaded from the Oracle Knowledge Base or the Oracle Solaris 11 Package Repository. You can also create images within Oracle Enterprise Manager Ops Center or obtain them from a location external to Oracle Enterprise Manager Ops Center and then import or upload them into Oracle Enterprise Manager Ops Center. An operating system can be in ISO format or FLAR format. Firmware can have various formats, depending on the vendor. ISO image – The image, also called a disk image, contains uncompressed directories and files of any type: application or data or both. This type of image can reside on removable media. Another type of image is a virtualization image. This type of image is stored in a Storage Library and contains the configuration information for a guest, its operating system, and the applications that the guest uses. An OS image contains an entire operating system in either ISO format or FLAR format. A subset of OS images are branded images, which install an operating system that is optimized for a specific purpose and can also include applications. OS images provision the operating system on both hardware servers and virtualization hosts. Table 5-3 shows the location of OS images. In addition to being grouped as packages and updates, Oracle Solaris OS images are also grouped into baselines. An OS image must be in a single image file. For example, on an Oracle Solaris system, the following command collects all OS component files on the auto-mounted file system into an ISO file. The Oracle Enterprise Manager Ops Center software uploads or imports one ISO file per operation. If you are loading an ISO file from physical media and the file spans more than one CD, combine the content on one DVD. An ISO file cannot be made from Oracle Solaris installation CDs. Firmware images provision hardware assets. A firmware image is a copy of the vendor's firmware file and metadata for the firmware, such as the platform it is used on and any software dependencies. You obtain the images by downloading them from vendor websites or uploading them from their product media. Firmware images are stored in Software Libraries. The maximum size of a firmware image is 20 MB. Storage Component firmware updates firmware on RAID Controllers, Expanders and Disks. When you import a firmware image, you might be required to provide metadata to complete the image file. You can usually find the information in the image's README file. You must provide the firmware type, the systems that the firmware supports, the version of the firmware, and any other firmware images that this firmware image depends on. The following is an example of a README file for ALOM-CMT firmware, where a single binary is deployed to the Service Processor. upgrade the firmware in their Sun Fire T2000. a)To update the Sun System Firmware, the system must be powered off (i.e. in standby mode). For this example, the VBSC firmware subcomponent/type with version 1.1.1 was used. You can use any of the other types such as ALOM-CMT:1.1.2 or OBP:4.20.0. However, you must ensure that the version specified is always the firmware subcomponent/type. To provision firmware or an OS, you use a deployment plan to direct Oracle Enterprise Manager Ops Center to retrieve the images from the appropriate software library and install them on the targeted assets. Each time you import an image, you also create a profile with the same name. You can use the default profile but, as a good practice, make a copy of the profile and rename the copy for use in deployment plans. Leave the original profile with its original name in the library. 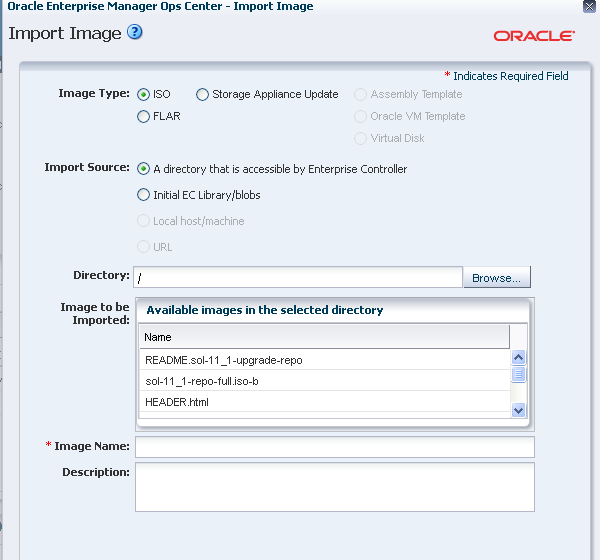 To use an image in a deployment plan, the image must be in one of the Oracle Enterprise Manager Ops Center's software libraries. You upload an image or import an image, depending on where the image resides. In both cases, you are moving the image from a location external to Oracle Enterprise Manager Ops Center's management into one of its libraries. If the image resides on the Enterprise Controller's system, import the image. If the image does not reside on the Enterprise Controller's system, upload the image. This operation relies on the browser to transfer the image file. The maximum size of an image that you can transfer using browser operations is 2 GB. If the image is larger than 2 GB, move the file manually to the Enterprise Controller's system and then import it. Click Software Libraries or Storage Libraries to expand. Click Import Image in the Actions pane. The Import Image window is displayed. Description of "Figure 5-4 Import Image"
Identify the type of format for the image. Identify the current location of the image file. For an ISO image file, the available source locations are the Initial EC Library or another location that is accessible to the Enterprise Controller. If the image file is located in an accessible location, enter the name of the directory or use the Browse button to navigate to the location. Select the image you want to import. Enter a name for the image and a description. Image names must be unique, can consist of up to 100 characters, and can include numbers, letters, and some special symbols. The following special symbols are prohibited: comma, asterisk, single quote, double quote, parenthesis, question mark, equal sign, and newline. Click Import Image to copy the image to the library. Although the action name is Upload ISO Image, you can use the action to upload a FLAR file. However, the original OS image, the image that the FLAR is based on, must also be in the same library. Expand Libraries from the Navigation pane. In Software Libraries, select the library in which you want to store the image. Click Upload ISO Image in the Actions pane. The Upload ISO Image window is displayed. Description of "Figure 5-5 Upload ISO Image"
Click the name of the file in the Source of ISO File field or click Browse to navigate to the image. Enter the name and description of the image. Click Upload Image. The progress of the upload to the Enterprise Controller is displayed. After uploading, the image is in the software library. The Upload Firmware action can be directed to retrieve firmware images from either the Enterprise Controller's file system or a local file system. Use the procedures in Keeping Your Firmware Up-to-Date in the How To library at http://docs.oracle.com/cd/E27363_01/nav/howto.htm to upload firmware. The UploadFirmware action is disabled for Exalogic systems. The firmware for a PDU consists of two files, one for the firmware and one for the management software of the PDU. Each firmware image must be imported or uploaded and then a profile created that includes both images. The firmware images must have metadata, which is not always included in the image. In that case, you specify the metadata during the import or upload operation. For the target type click PDU. For the platform, click Sun Rack II PDU. Enter the version of the firmware. Choose Depends On None and accept the remaining default options. After the job is completed, repeat the procedure with the other firmware image, HTML_Vfirmware_version.DL with one difference: At Step4, specify that this firmware image depends on the MKAPP_Vfirmware_version.DL image. Expand Plan Management in the Navigation pane. Click Create Firmware Profile in the Actions pane. For subtype, click Power Distribution Units. For target type, click Power Distribution Units. Click Next. For Firmware Configuration, accept the default options and values. Click Next. Select both images: MKAPP_V<firmware_version>.DL and HTML_V<firmware_version>.DL. Click Next. Review the summary of the new profile and click Finish to submit the job. This section does not apply to Oracle Solaris 11. To add custom content for Oracle Solaris 11, use pkg commands to add the content to a local IPS repository and then import the repository into Oracle Enterprise Manager Ops Center. To use custom scripts, use an operational profile with either the Execute Operation action or an operational plan. See Operational Profiles and Plans. The Linux and Oracle Solaris 8-10 Software Update Library also stores and gives access to site-specific configuration files and scripts used in deployment plans. This local content can also include data files, executable files, or binary files. For example, you might develop a script to test servers before running a provisioning job. You can view details such as distribution, version, release, group, size URL, when the file was added or edited, any summary and description information, host, RPM, and vendor. The Local categories of the Updates Library have no connection to the Knowledge Base. You upload local content to the software library, directed into one of the categories, and then maintain the files throughout their life cycle. Local content is organized into the following default categories: local RPMs or PKGs, configuration files, macros, pre-actions, post-actions, and probes. You can create subcategories to further organize your local content. The type of local content allowed in a subcategory depends on its parent category. Click Linux and Oracle Solaris 8-10 Software Update Library. Click Add Local Category in the Actions pane. Enter a name for the new subcategory. Enter a brief description for the new subcategory such as its purpose. Click Distribution to assign to the subcategory. Click Parent Category to select one of the system-defined categories for the subcategory. Click Apply. The new subcategory is created under the selected default category. You can now upload software packages and files into the new subcategory. Pre-Actions – Script that runs on a managed host before the provisioning step starts. When you create the deployment plan, you select the Execute Pre-Install step and then select the profile that includes the script. Post-Actions – Script that runs on a managed host after a job is completed. When you create the deployment plan, you select the Execute Post-Install step and then select the profile that includes the script. Probes – Script that runs on a managed host to verify that a job can be performed. Macros – Script that modifies a generic configuration file to make it specific for a managed host. Use macros to apply a single configuration file across multiple hosts by customizing the configuration file for each host's environment. The script outputs a single line that replaces a macro sign in a configuration file. Click Upload Local Action in the Actions pane. The Upload Local Action window is displayed in Figure 5-6. Description of "Figure 5-6 Local Upload Action"
Enter text to describe the purpose of the script or executable file. Select the type of action such as Pre-Action, Post-action, Macros, or Probes. Click the name of the distribution that is appropriate for the script or executable file. The Parent Category field shows the category you specified as the type of Action. If your site uses subcategories, click the Browse button to navigate to the specific subcategory. Click Browse to locate and select the script or executable file. Click Upload. The file is uploaded to the Linux, Solaris 8-10 Software Update Library in the category you specified. You can now create a profile for the script and then use the profile in a deployment plan. If the file is in compressed format, the file is uncompressed after it is uploaded. Click the operating system's Software Update Library. Click Upload Local Software Packages in the Actions pane. Select Yes if the package is a security fix for a previous version of the software. Otherwise, select No. Click the name of the distribution to which you want to add this package. In the Parent Category section, click Local PKGs or click Browse to locate a subcategory. In the Files section, click Add to see the list of files. Select at least one software package. You can now include the package or RPM in an provisioning profile. A configuration file is a text file, binary file, or non-RPM application that contains the settings and values for an asset type. To use the uploaded file, create an Update profile and include the profile in the deployment plan that installs or upgrades the OS. 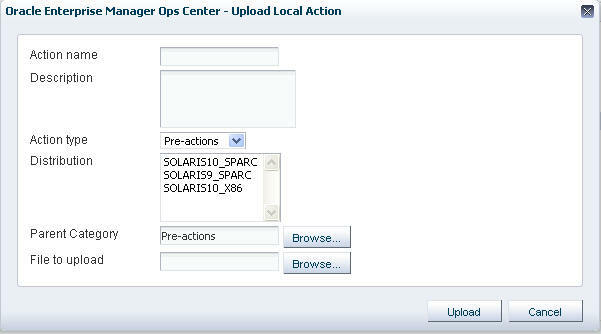 Click Upload Local Configuration File in the Actions pane. The Upload Local Configuration File window is displayed in Figure 5-7. Description of "Figure 5-7 Upload Local Configuration File"
In Target path on server, type the full path to the configuration file. In Version, type a character string to identify this version of the file. The string is appended to the file name when it is displayed in a Components list. Enter a brief description of the file. Select the Distribution to which this file is applied. You can choose multiple distributions. In Parent Category, accept the Configuration Files category or click Browse to locate a subcategory. Click Browse to locate and select the configuration file. You can upload multiple files or an entire directory in one operation. For example, you can upload the contents of a DVD. All components in the directory and subdirectories are uploaded. If files are compressed, the software extracts the files after it uploads them. Verify that the files have the supported file types. Verify that the file size does not exceed 2 GB. If the file is larger than 2 GB, copy the file manually to a file system on the Enterprise Controller's system. If you are uploading from removable media, insert the media. Click Bulk Upload Packages and Patches in the Actions pane. The Upload Packages, Patches, and RPMS window is displayed in Figure 5-8. Description of "Figure 5-8 Upload Local Software"
Click Distribution to select the distribution that applies to these files. Select either Upload from OS Image or Upload from Directory. Specify the path to the OS image or directory or click Browse to locate and select it. If you specify a directory, all files in the directory and its subdirectories are uploaded. If you specify an OS image, you must mount the OS image and select the files. Click one of the OS images and click Mount. Click Browse to locate and select the files. Click Submit. The upload job is created. To view the status of the upload job, select Bulk Upload Results. To view the certified packages in the software update library, click the Content tab in the center pane and select Patches in the Category list. To view non-certified packages, click Local PKGs or Local RPMs in the Category list. You can view a detailed history of all the local components that were uploaded in bulk. Click Bulk Upload Results in the Actions pane. The uploaded components list displays the name, description, status, and date for each component. Select a component and click View Results. The details of the uploaded components are displayed. The local content that you uploaded to the software library is used in profiles and deployment plans to guide and complete provisioning operations. For example, a local configuration file can be modified by the output of a macro so that each target gets the appropriate configuration file. Create the macro named mymacro and upload it to the software library. Create the local configuration file and upload it. ### the following line to the output of "mymacro"
### Include this configuration file in the profile. Create an Update profile and deployment plan to include the local configuration file. You can edit files in the Local Categories. For example, if you uploaded a file that contained IP addresses and determined that there was an incorrect IP address in the file, you can edit the file to correct the IP address. You can also use this procedure to replace the file with a corrected file. Click Edit Local Component File in the Actions pane. To specify the file, type its name or click the Browse button to navigate to the file. If the file is not found, click Distribution to select the correct distribution. Only files in the selected distribution are displayed. Select either Edit existing file or Replace existing file. If you choose to edit the file, make changes to the file and click Save. If you choose to replace the file, browse for the replacement file and click Upload. You can remove your site's local content or added categories. You cannot remove the default categories. Deleting content does not require confirmation and cannot be undone. Verify you are deleting the correct local component. Click Delete Local Component in the Actions pane. Expand the category to display the component you want to delete. To change the distribution, click Distribution. Select the file or a subcategory to delete. To remove a subcategory and its components, do not attempt to remove each component and then remove the subcategory. When there are no components in a subcategory, the subcategory creates a placeholder component, which you cannot delete. Repeat the procedure and select the subcategory itself to delete. The placeholder component is also removed. The ecadm backup command does not back up the software libraries. As a good practice, create the software library for OS images on networked storage (NAS) and include the network storage device in your site's backup plan. As an alternative, back up the Enterprise Controller's directory manually. Move the archive to another server, file-share facility, or a location outside of the /var/opt/sun directory, according to your site's disaster recovery plan. If it is necessary to rebuild the Enterprise Controller, restore the Enterprise Controller and then restore the /var/opt/sun/xvm/images/os hierarchy. For instructions in performing actions or to learn more about the role of this feature, see the following resources in the How To library: http://docs.oracle.com/cd/E27363_01/nav/howto.htm.